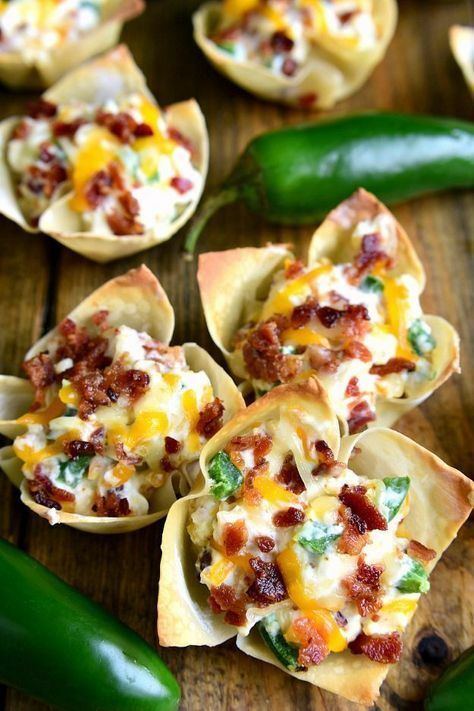 Jalapeño Popper Wonton Cups are loaded with bacon, jalapeños, cream cheese, cheddar cheese, and sour cream….all in a crispy wonton shell! The perfect party or game day appetizer! 1 c. shredded cheddar cheese reserve 2 Tbsp. Place one wonton wrapper in each muffin cup; bake 8 minutes or until lightly browned. In a medium-sized mixing bowl, stir together cream cheese, sour cream, bacon, cheddar cheese, and chopped jalapeños. Spoon filling into wonton cups, then sprinkle with reserved bacon and cheese. Return to oven and bake for an additional 8-10 minutes, until wontons are golden brown and cheese is melted. 0 Response to "Jalapeno Popper Wonton Cups"